Image from the 2003 Derby workshop. Attention Students: The February 16 deadline to apply to the Collegiate Sports Journalism Seminar at Churchill Downs is heading into the final turn and is fast approaching. If you would like to spend 4 days learning from top-notch professionals, then this is the workshop for you. The tuition free event and the faculty includes: Dave Black, Skip Dickstein, Bill Frakes, Lucas Gilman, Joe McNally, Rick Rickman and many others. 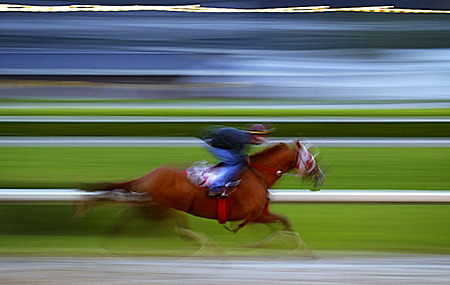 If selected to attend, you will spend your time photographing the racing and pageantry surrounding Churchill Downs the week before the Kentucky Derby. That, combined with presentations and breakouts from the faculty, makes this unique and educational. Sponsoring the event are several of the industry's top companies: Nikon, Apple Computers, Penn Camera, Epson, and many more. Jabbed in the ribs, smacked in the head, eyed by the SS. Welcome to the Iowa Caucus. ::..